I will be helping out at the stalls on that day so do come over and visit. There will be lots and lots of attractions - food, fun, celebrities, games, belly dancing, kick boxing and many more for the sake of charity so do come and support it. There will be Soo Kui Jien ( better known to all of you as Jien from Malaysian Idol fame) as the MC and DJ. Guest appearances from Fly Guy and his crew and Paula Malai Ali. Performances by Malaysia's R&B sensation, Liang performing songs from his album, 8 ozs of Soul, Elvis Presley (yes, he is alive and in Malaysia), Eliana Belly Dancing (from Russia), Kickboxing and Aerobics by Clark Hatch and Line Dancing. There will also be a dunk machine (time to drag your enemy out there so you can dunk him/her), lucky draw, ring toss game, kid events, sandart and of course food stalls. Last weekend after hearing Robyn's raves on Padi Prada, a whole group of us headed there for dinner with an overseas guest who is touring around Asia. Although the place is pretty far i.e. Kota Kemuning in Shah Alam, the township is accessible through a network of highways so it was a pretty easy ride. The place was crowded with families having their weekend dinner and we settled in to order our dishes. The owner recommended us a few of their special dishes which we ordered. After she had gone to place our order in the kitchen, we were a bit worried that the portions were simply not enough for us since there were such a large group of us. Subsequently we had to add more food orders which we all polished. The first dish we had was Ju Hoo Char made from shredded jicama bean, carrot, cabbage, Chinese mushroom and dried shredded cuttlefish. 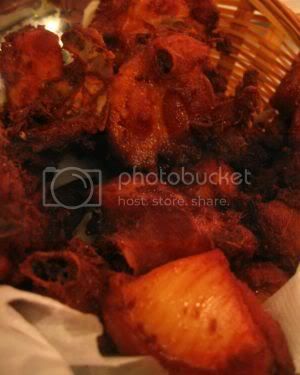 Usually the cuttlefish is marinated in vinegar before it is fried. 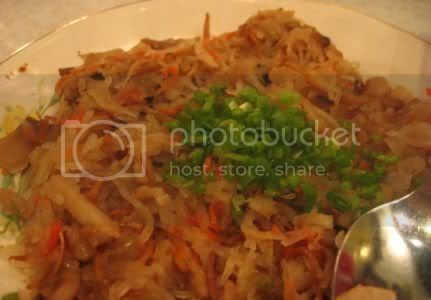 The shredded vegetables are simmered in stock until they are tender and drained. It is then tossed with the cuttlefish and mushrooms. Padi Prada's version is served with lettuce leaves which you add a bit of Ju Hoo Char and a dollop of their chilli sauce on top and savour. We ordered two portions of their Otak-Otak and it was really good stuff. This version is the Northern type and looks pretty similar to the Thai version. 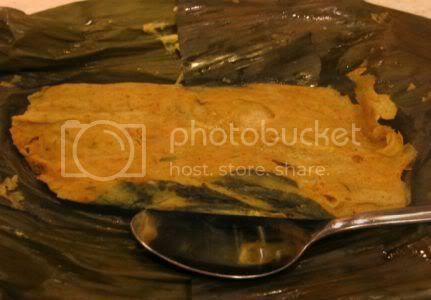 It came with chunks of fish inside it and is steamed with fragrant betel leaves in a banana leaf parcel. We ordered the stir fried brinjals/aubergines/eggplant. Not too sure what it was fried with but it was not the usual sambal belacan. An essential order in Nyonya restaurants, Inche Kabin which is deep fried turmeric chicken. This is the Prawn Curry, not many prawns in it but the curry sauce it came with was full of flavour and went so well with the white rice. 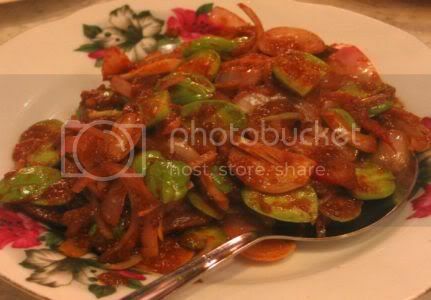 Another must have dish, the Sambal Petai. Petai is also known as stinky beans as they cause quite an unpleasant smell once consumed. These beans are found in jungles and is usually collected by the local Orang Asli. 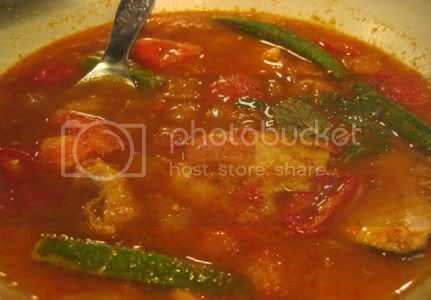 This is the Gulai Tumis, assam based fish curry. I like the taste of their curries but they are a bit watery though. 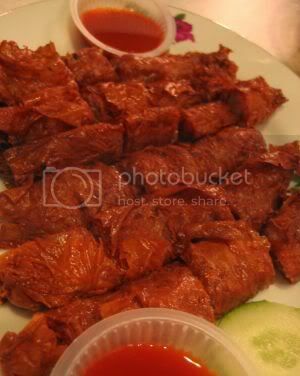 My absolute favourite, Lor Bak which is chopped meat wrapped in bean curd skin that is deep fried till it is crispy. 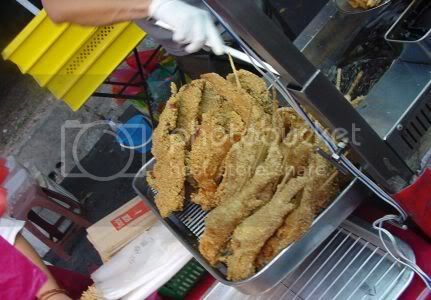 Padi Prada's version is very nice: crispy on the outside but the filling is soft and flavoursome. 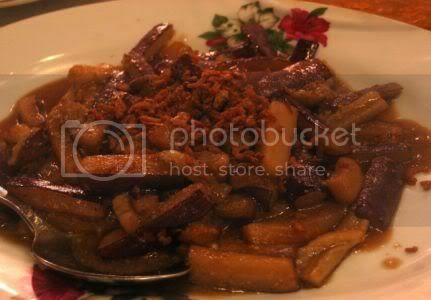 The Lor refers to the thick brown sauce usually served with this dish that is made from dark soya sauce, five spice powder, egg white and corn starch. 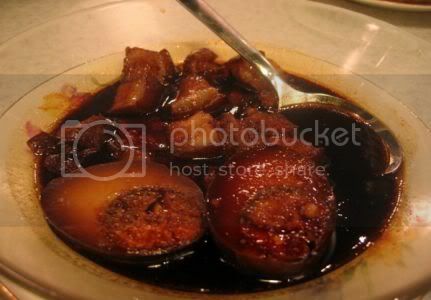 Another famous dish, Tau Yu Bak which basically means Pork (Bak) in Black Soya Sauce(Tau Yu) in Hokkien. The pork and hard boiled eggs are braised in black soya sauce with spices such as five spice powder, star anise, cinnamon and cloves till it's full of flavours and soft. 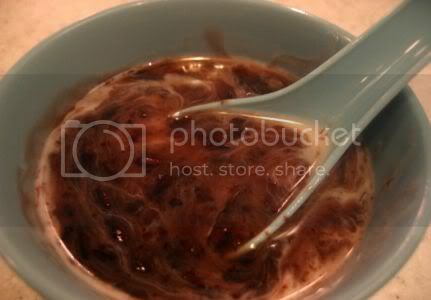 We also had complimentary desserts, black glutinous rice porridge with coconut milk. The rice is cooked with water till it is soft and creamy. 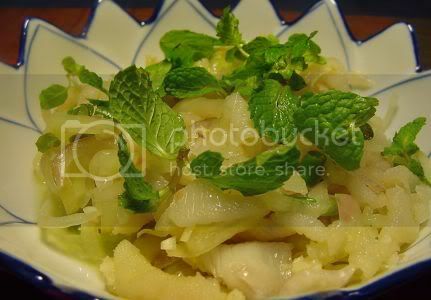 Subsequently it will be simmered with pandan leaves and sugar to give it flavour. Just before serving, a few tablespoons of coconut milk will be added. You can stir it in to make the porridge to make it creamier. Overall, we all enjoyed the dinner and wouldn't mind coming back again especially for their otak-otak and lor bak. Thanks to Shiewie for taking the lovely pictures. It's been a while since I cooked and it was great to fire up the gas hob last Friday for my first attempt in Dum cooking. I had read about this type of cooking from the Flavours magazine and was eager to try it out as it sounded like a wonderful way to infuse the meat with spices. Basically it uses dough to cover a claypot so the steam is trapped inside and allows the food to cook in the steam and absorb the spices. I chose to make the lamb kofta and made certain revisions to suit the items I had at home. For instance, I used a Chinese claypot instead of the wider Indian claypots since that was all I had. For the flour, I used self raising flour to make the dough to seal the claypot. 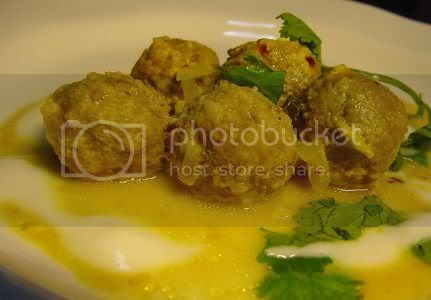 It worked really well for me and we both loved the tender lamb koftas with their heady fragrance of spices. The sauce is tinged yellow from the turmeric powder used and I added chopped coriander leaves and a dash of yoghurt sauce to make it creamier. To keep with the Northern Indian theme, I served the dish with basmati rice cooked with some crushed green cardamon pods. Combine the flour with just enough water to bind into a stretched dough. Use it immediately or cover it with a damp cloth and store in the fridge. Place the minced meat in a mixing bowl. Add the rest of the meatball ingredients, seasoning to taste with the salt and pepper. Roll level tablespoons of the mixture into balls. To make the sauce, heat the ghee/oil in a claypot and add onion, chilli, ginger, garlic and turmeric. Stir over low heat until the onion is soft. Add the coriander, cumin, chilli powder, vinegar, meatballs and water. Stir gently and simmer for 20 minutes, before adding the yoghurt and coconut milk. Mix well. Seal the claypot with the dough and lid. Simmer for 10 minutes before removing from heat. Set aside for about 5 minutes before opening the lid. Serve hot with gravy poured over. Garnish with chopped coriander and saffron. I have decided to do a kinda Malaysian food blog watch where I summarise on a weekly basis, what other blogs are talking about the food in Malaysia. Although I usually keep a pretty updated Malaysian food blog list, I found out that not all bloggers just talk about food, so it's pretty hard to categorise them as food blogs. The links are mainly found from food blogs I read plus the pings from Project Petaling Street so they may sound familiar to you but alien to the foreigners who don't read the local blogs. The summary also helps me keep track of food finds that I want to try out so you may see me visiting some of the recommended places later on. Sorry, no pictures of the food they talk about but I will slowly work them in later posts. I thought I'll start with the latest food event that is this month's special joint SHF/IMBB event. Swee from Just Heavenly was the first to post her entry as she had a special cook off with friends during her holidays that included smoothies. She made some yummy looking chocolate cookie pretzels and green tea shortbreads. Subsquently, Rachel from Tham Jiak shared with us the all time favourite, pineapple tarts. I guess great minds think alike since I also made something with pineapple jam for my Cookie-Swap. Babe from Babe in the City was next and she quickly whipped up Crunchy Jumbo Snickers Cookies that her little son loves so much, he asks for them on a daily basis. Finally, the cute little Rabbit from Pearl of the Orient made the most adorable Gingerbread Teddies that her family was reluctant to even taste them as it was a shame to eat something so cute. I can understand why as the teddies are so lovingly decorated by her with different outfits. The Makan King who has been away for some time blogged a bit on Beard Papa which is set to open in Mid Valley Megamall soon. He is not the only excited one as Sue from Funky Cookies also posted something on the Beard Papa fever all over the world. 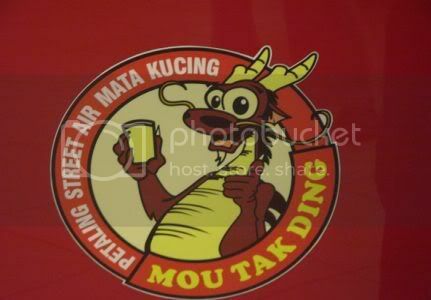 Last week, I had blogged a bit on the Petaling Street Air Mata Kucing stall in Mid Valley Megamall, Paul Tan also got into the action with his memories of the stall. What's Cooking in Malaysian Kitchens? Malaysians are a pretty varied lot and will make anything under the sun just to satisfy their tummies. Babe from Babe in the City introduced us to Instant Roti Canai, perfect for those days when you just want to chill out at home. She also made a peach yoghurt smoothie and ice lollies. Simmie from What's For Dinner? made Tiramisu in a cup for her Thanksgiving dessert while Shawn of Away from Home in Edinburgh came out with a yummy looking Belacan Fried Rice from his leftovers. Swee from Just Heavenly outdid herself as she made Ham in Coca-Cola and Sweetcorn Pudding from her new cookbook, Nigella Bites for a pot luck. Teckiee from Big Head Big Hat made her first carrot cake with cream cheese frosting. Looks good for a first timer. LavaMama from Everything That Is or Was Began in a Dream made smiley steamed egg cakes and peach marshmallow dessert for her friends. They sell this in Malaysia...? Sometimes bloggers also talk about what's new and happening in Malaysian shops and it's great as you get to discover new food items on the supermarket shelves or even home businesses. LavaMama from Everything That Is or Was Began in a Dream raved on about Lays new Stack potato chips. Terenceg shared with us some beautiful looking layer cakes with a flower pattern that costed a mini bomb. Huai Bin from Sixth Seal shares with us an interesting Lady Fingers (Okra) snack from Taiwan he found in Malaysia. He also blogged about Lays new Stack potato chips. Food is in abundance all over Kuala Lumpur and it's nearby areas so it's not surprising that bloggers always talk about their great finds. Shaolin Tiger kicks off this eating session with a list of his favourite Malaysian foods and they all look so good! The Makan King introduced us to a ginormous roti tissue that his friend had at the mamak stall. I don't think I have ever seen anything so big before! Dim Sum seems to be the choice for Malaysians during the weekends as Julie the Biscuit made a detour to Chynna for some yummy teeny weeny eats plus some eight treasure tea served in a long spout teapot. I wonder if she bumped into Earl-ku of Love Foolospher who also posted pictures of his dim sum experience in Chynna and was casting admiring looks at the cute waitresses too. Shanghai food is never far away as LavaMama went twice to Crystal Jade in Lot 10 to try out the food. Wyejon from Wantan Productions tried out Dragon-i at 1 Utama for a birthday dinner and was not impressed with the food. I have not tasted Ulu Yam's Lor Mee but it looks good as LavaMama tried an outlet in Kepong. She also introduced us to her favourite Nasi Lemak stall in ss2. Not only that LavaMama did a taste test comparison on Taiwan Noodles( Ampang, ss2 and Kuchai Lama) which got me hankering to try the Kuchai Lama ones now. Julie the biscuit found some cheap ramen noodles at Tenka Daiichi Ramen, Wisma Central. She also visited a place called Friendster cafe which may or may not be associated with the famous friendster website. KY from KY speaks discovered the steamed rice place in Kelana Jaya which is one of my favourite places too. I can always rely on KY for great eats and he recommends the steamed tilapia in Rawang. Aprilcherrie was everywhere last week as she went to Salak South for Char Siew, SS2 for Curry and Tomyam Seafood Noodles, Ikan Bakar (Malay for Grilled Fish) in Sri Petaling and Chillies in Bangsar. Malaysians love to travel for good food as seen by this bunch who brings us eats from Penang, Ipoh and Sibu. After reading their posts, I often want to jump into my car and drive all the way there for the yummy food. Darryl of The Cypher Inc. is back in Malaysia for a holiday brings us for great eats in Ipoh ( I have fond memories of that coffee shop, Kong Heng) and Bidor's famous duck noodles. KC Yap from Point of View shared with some views of the night market in Sibu and an unnamed dish which he says is the best he tasted. Dragon City tempted me to visit Melaka like right now with his yummy coverage on Capitol Satay's famous satay celup. 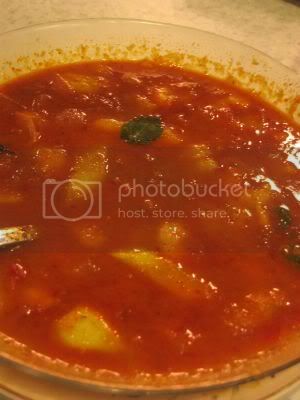 I heard there is an outlet in Subang Jaya, must go search for it as the food looks great. 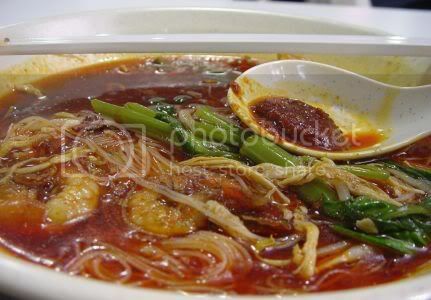 My So Called Life made me drool over his pictures of Penang's New Lane Char Koay Teow and the famous Batu Maung satay. He didn't stop there as he also shared some pictures of the koay teow from Lorong Selamat. Shameless to say, I love that char koay teow and paid an exhorbitant price for it and waited! Lilian from Malaysia Best went for a little holiday to Kuala Lumpur but she stopped for some shiny Ipoh Chicken Rice. The talented Rabbit from Pearl of the Orient shared with us some of her favourite eats in Pulau Tikus: western food, char hor fun and mee basah (first I have heard of that dish before). Hope you enjoy the summary and happy eating! Deck the halls with boughs of holly! Fa la la la.....Tis' the season to be jolly and eat lots of yummy food which includes delicious cookies! When I saw the Domestic Goddess and Alberto's announcements for the joint SHF/IMBB Cookie-Swap, I was so happy as I love cookies. Although in my family, cookies are more of a Chinese New Year thing, I am so in the festive mood (fa la la la....) that I decided to celebrate with cookies this Christmas. 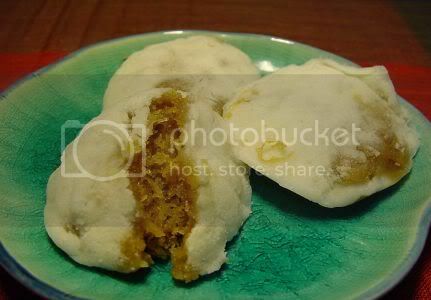 Ever since I can remember, my mother has been making three traditional cookies for Chinese New Year. They have become our family's signature cookies and everyone will wait in anticipation to receive a box from us during the festive season. 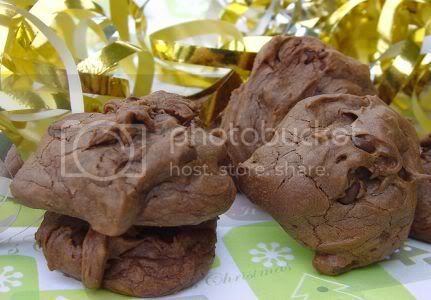 Only close relatives and good friends were privileged to get these cookies as a lot of work goes into preparing them. I'll be sharing two of the cookies with you all this time round as I managed to persuade my mother to give me a refresher's course on making them as it has been a while since I helped make them. Most Malaysians will be very familiar with this cookie as you see versions of this everywhere especially during the festive season. They kinda remind me of Mexican Wedding Cookies but the Malaysian version is made from peanuts as this is a more popular and cheaper alternative. The key to this delicious and fragrant cookie is toasting the peanuts and adding a sprinkling of toasted sesame seeds. Another very important bit is you need to choose the right peanuts as there are quite a few varieties; some for soups, deep frying or toasting. I usually go to our Chinese dry goods stall and ask them to select the peanuts for toasting and they will pack them accordingly. We use the traditional way of toasting them in a cast iron wok over low fire, constantly stirring them so they become brown evenly. Once they are browned sufficiently, you will need to peel out the skin. Sometimes when you fry them, the skins may come out in the process. If not, you can use a basket (as seen below) to shake out the bits and pieces of the skin. If you are not sure how toasted the peanuts should be, do a taste test. Set it aside and leave it to cool, then taste them to see if they are crunchy enough. Remember that if they are too burnt, you will need to discard them or else your cookies will be bitter. Don't skin them before toasting them as the skin helps prevent the peanuts from burning too fast. Once toasted, cool them and you can keep them in an air tight jug. Although making the cookies does not take long, it's the preparation of toasting the peanuts which is a bit back breaking so do this ahead and keep the peanuts ready when you want to make your cookies. I got into a bit of a festive mood so I dragged out my Christmas decorations to jazz up my cookies. Here they are with a bit of holly and ribbon, all ready for a yummy Christmas. They melt in the mouth and you can taste the toasted peanuts and sesame seeds. Grind the toasted peanuts and add to sifted plain flour and icing sugar. Mix them thoroughly together with the toasted sesame seeds. Add the cooking oil slowly and mix till evenly coated. Roll a little ball of dough and place on a greased baking tin. 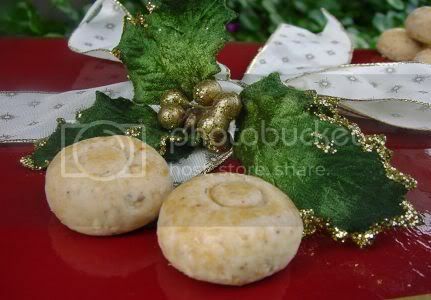 You can use a marker pen lid to make the circle or add a toasted peanut on top for decoration. Beat the egg yolk and salt together, brush a bit on top as this will give colour to your cookie. Preheat your oven to 150C and bake for twenty minutes. Remove from oven and cool before removing cookies from the tin. Once cooled, pack in air tight container. 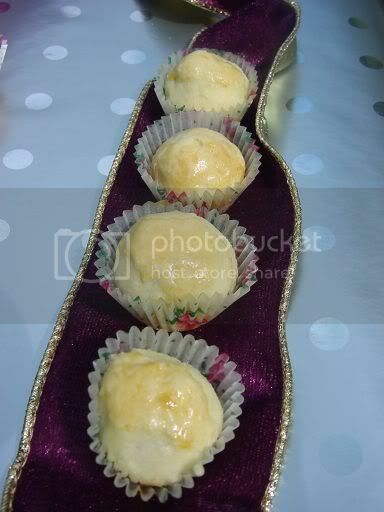 During Chinese New Year, serving pineapple jam tarts or like my family's version, pineapple balls is essential. This is because the Chinese believe it brings good luck since the chinese term for pineapple is "Wong Lai" that also sounds like luck is coming. Like the peanut cookies, a lot of work goes for the preparation and this time it's the pineapple jam. Nowadays, you can actually get pre-made pineapple jam at the bake shops so if you wish to skip this part, just do so as it saves you a lot of time. We like to make our jam from scratch and it keeps pretty well especially in the freezer. The best part of making this jam is you can actually take your time to do it, i.e. stop halfway and say continue the next day. First, you need to get fresh pineapples from the fruit stall. Do tell them that you plan to make jam so they can pick you the riper ones. You will need to take out the "eyes" of the pineapple and core them. Once that is done, cut them into small pieces and blend them till it becomes almost a pulp. Don't make it too fine as you want some texture to the jam. Put this into a large saucepan(metal) and stir it over a medium fire so it dries out. You need to constantly stir the jam or else it will burn. Once it is almost dry, add the sugar, switch to low fire and stir constantly. It's important that you keep stirring or else the sugar burns and your jam will be ruined. Keep stirring until the sugar caramelises and the mixture becomes sticky plus pulls away from the bottom of the saucepan. Once that is done, cool the jam and store in the fridge or freezer until you are ready to make the cookies. Left: Pineapple jam bubbling away, Right: Rolled up pineapple balls. You will need to make the pastry and remember to use good quality butter (I used SCS brand) or else you do not get the buttery plus melt in the mouth texture. Unlike the tarts, pineapple balls are softer and more buttery. I distributed some of the pineapple balls to my friends and they said the pineapple balls are so sinfully buttery, they need to hide them in their fridge or else they will finish them in one sitting. One of them even called these cookies "evil little butter balls" and is restricting herself to them bit by bit. More Christmas decorations and I have placed the pineapple balls on top of a purple velvet ribbon all ready to be wrapped up in some silver paper. Cut the eyes and core of the pineapple. Chop into small pieces and place in a blender. Blend until it is pulp but not till it is so fine it becomes juice. Place in a metal saucepan and over a medium fire. Stir constantly until it almost dries out. Add the sugar slowly and taste to make sure it is not too sweet. The amount of sugar to be added depending on whether the pineapple is tart or not so go slow on adding the sugar till you taste it. Once the sugar is added, stir the jam constantly to make sure it does not burn. Once it gets sticky and caramelised, switch off the heat and cool. You can roll them in balls as seen above to be used to make the cookies. Cream the butter and sugar until it changes colour. Add the vanilla essence and beat it in. Fold in the flour and the salt until it is mixed thoroughly. The dough may be too soft, check to see if you can manage rolling it. If not, add 1 1/2 tablespoon of flour to make it less sticky and leave it uncovered for half and hour. Once the dough is not so sticky, take a bit into your hand and flatten it. Place the jam ball inside the dough and roll the dough to cover the jam. Make sure it is properly covered and the thickness of the dough is even. Roll into a ball and place in the paper cases. Brush the top with egg wash. Bake in an oven heated up to 160C for thirty minutes. Preheat the oven to 375F. Line two baking sheets with parchment paper. In a small bowl, whisk together the flour, baking powder and salt. Set aside. In a bowl of an electric mixer, briefly whip the eggs to break them up. Add the sugar, espresso and vanilla and beat on high speed for 15 minutes until thick. While the eggs are whipping, place butter on top of a double boiler or a metal bowl suspended over a pot of simmering water and scatter the chopped chocolate on top. Heat until the butter and chocolate melt. Remove the boiler top from the water and stir the chocolate and butter uintil smooth. Gently fold the chocolate mixture into the egg mixture until partially combined (there should still be some streaks). Add the flour mixture to the batter and gently fold in. Fold in the chocolate chops. If batter is very runny, let it rest till it thickens slightly, about 5 minutes. Drop the bater by heaping tablespoons onto prepared baking sheets and bake till puffed and cracked, about 8 to 9 minutes. Cool on wire rack before removing from baking sheets. Hope you enjoyed my cookie fest as I had lots of fun making all these. I distributed quite a few to different taste teams too so I hope they enjoyed it. The pineapple balls were also stolen by the ginger kitten during a photo session and he seemed to like the buttery pastry too as he ate it all up. I can't wait to see the other cookies and do remember to visit the Domestic Goddess and Alberto's blog for the yummylicious round-ups. Eating grass is good for you! Those pesky kittens are still unadopted so this is another plea to all you nice aunties and uncles, please take them away! 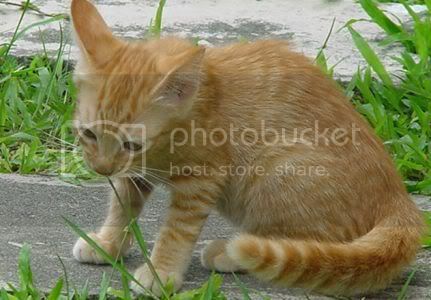 Mum took some pictures of them prancing in the garden (they do that quite a bit, it seems) and I decided to steal the ginger kitten ones and put them up. Besides the kitten issue, life here is boring, the same thing everyday. I can't wait to move to the new house though, Mum tells us there will be a fish pond. (Hee! Hee! Instant food) She has been super busy with the new house especially this weekend since it is meet contractors and get quotations this time round. Oh and don't forget that this weekend is the IMBB/SHF Cookie-Swap. Even the kitties got to taste test the cookies and they are so yummy that we want a whole box to ourselves. P/s head over to Auntie Clare's at eat stuff where you can see Kiri the cat and pictures of my kitty friends from all over the world. If you like doggies, please hop over to Auntie Sweetnicks to join them for Weekend Dog Blogging. I am all tired out after all that running around - need to sit down and take a break. Recently when I was in Mid Valley Megamall, I spied this new stall at the Lower Ground area which was selling the famous Petaling Street Air Mata Kucing. Looks as though I'm not the only one as coincidentally Paul Tan also blogged about it yesterday. What really caught my eye was the design of their stall with the dragon motif everywhere. Not sure what is the significance of the dragon but it does look a bit like Mu Shu the dragon from the Disney cartoon Mulan. On the sign above the stall, he is giving the thumbs up sign while holding the drink. The refreshing drink is extremely popular in Petaling Street as one can cool down drinking it especially after walking around the stalls. They used to serve the drink in metal bowls which made it colder and somewhat nicer but that practise has recently been abandoned. At the other end of the stall, they had a little glass display cabinet with all the ingredients to make the air mata kucing drink: winter melon, rock sugar, dried longan and Buddha's Fruit (luo han guo in Chinese). Traditionally these items are boiled in a claypot over a charcoal fire. 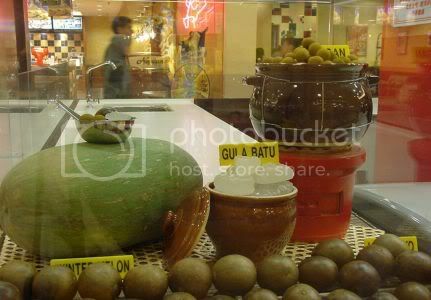 See the little metal bowl with the ingredients inside on top of the winter melon, those are the metal bowls they used to serve the drink in. The term air mata kucing means longan drink as mata kucing is Malay for a type of longan we get locally. If you wish to try to make this drink at home, hop over to Green Apple as she made some recently when she was homesick for the drink. I just love their logo and it's everywhere on the stall and even on the plastic containers they serve the drink too. I interpret the dragon as them saying even the dragon who breathes fire loves this refreshing drink that can cool him down. 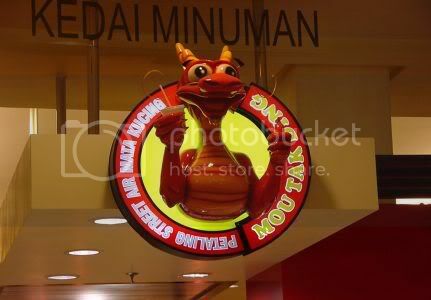 Another thing that tickled me was the term, Mou Tak Ding on the logo and the fact the stall is owned by Mou Tak Ding Sdn. Bhd.. Mou Tak Ding means so good that it's unbeatable in Cantonese. It's not the first time that term has been used in the food and beverage world, in Taman Tun Dr Ismail, there is a shop called Mou Tak Ding claiming the hawker food they sell is unbeatable. Another rival shopowner then opened a shop nearby calling himself Yau Tak Ding (Cantonese for can be beaten) to show that his food is definitely better than the other shopowner. Mid Valley Megamall seems to be the place to get modernised version of the Petaling Street snacks as somewhere along the stalls, there is also one stall selling the famous rice roll (chee cheong fun in Chinese) from Petaling Street. There will be more changes to the Lower Ground floor as Beard Papa (the old fella who sells those yummylicious choux cream puffs with vanilla beans) will be opening soon and hopefully the C-Jade Express (next to Yoshinoya) will also be opening soon as I love their pastries and snacks. This weekend will be a busy one as it's the IMBB/SHF Cookie-Swap. Lots of cookies from all over the world to be featured and I can't wait to see what comes out from everyone's ovens. I spied some already over at Just Heavenly, as she made some cute chocolate cookie pretzels and green tea shortbread. Recently, I was wandering around Mid Valley Megamall wondering what I should eat and I chanced upon this freshly opened branch for Killiney Kopitiam. 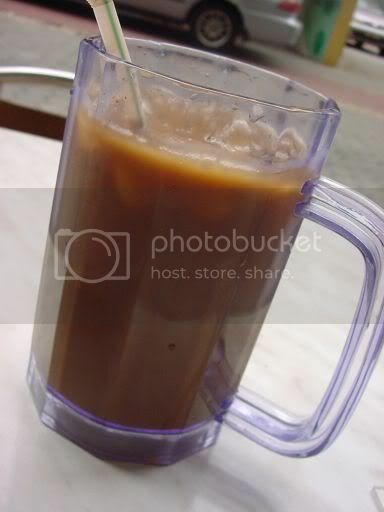 Singaporeans will be familiar with this kopitiam since it originates from Singapore and is famous for their roti kahwin i.e. kaya toasted bread and coffee. This is not their first outlet in Malaysia as they have had one for a few years around Damansara Uptown. This particular one occupies a teeny weeny space between Secret Recipe and Chillis on the ground floor of the mall. As they are famous for their coffee, I ordered a refreshing iced coffee. Simply great stuff that went down well with my spicy meal. Lunch was their signature Mee Siam - Singapore style which came with a spicy sweet and sour soup. I have yet to eat this version as I usually eat the dry Mee Siam with the tau cheo sauce (a brown sauce made from salted soya beans) that my friend, Miss P's mum always prepares for us. I liked this as it's pretty more-ish with that sweet and sour tang that comes from the tamarind, tau cheo and gula melaka. Only bummer is it's pretty devoid of ingredients as they only give you bits of taufu pok (Chinese for deep fried tofu puffs), spring onions, bean sprouts and one hard boiled egg. 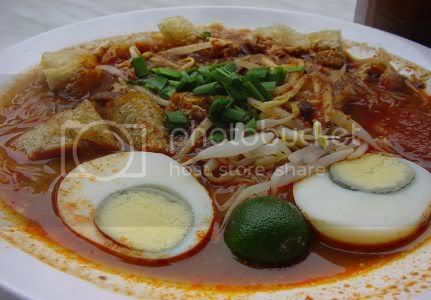 This I read is the traditional way of serving Mee Siam. The Mee Siam has definitely got me hooked so I will be making more trips to this place or their outlet in Damansara Uptown to eat it besides their kaya toast and half boiled eggs. 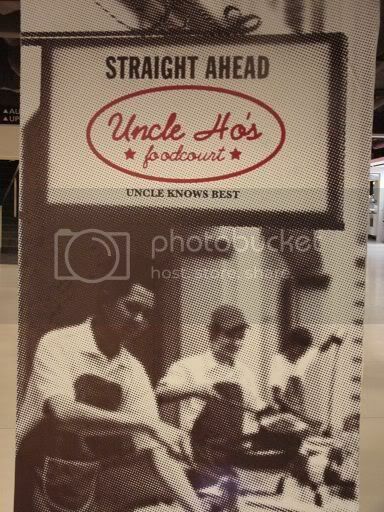 I couldn't help laughing when Splashie Boy said we will be trying the new foodcourt in Avenue K this week for lunch and it's name is Uncle Ho's! I didn't know that fella had branched into the food business following the success of his DVD/VCD empire. 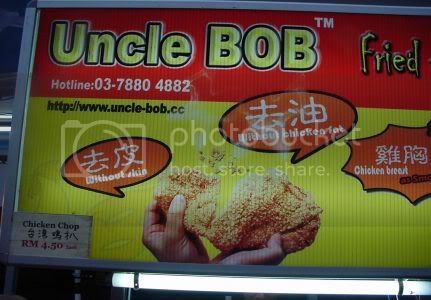 A lot of you may not know who Uncle Ho is, he is a fictional character (I hope he is!) from TV Smith's Dua Sen that describes a man who runs Malaysia's largest pirated DVD/VCD network. There is lots of different varieties: Bakso soup, Chola Spice (Indian food), vegetarian, yong tau food, teppanyaki, claypot, hotplate, thai, penang food, chinese, malay food and etc etc. Since we were early, I decided to try the Penang food while Splashie Boy queued up at the Thai Beach outlet. 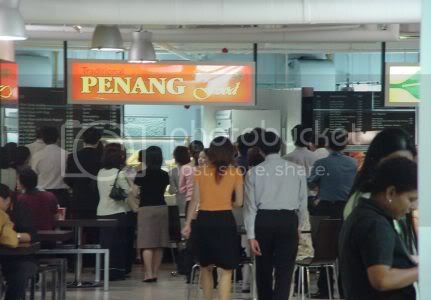 I picked the Penang food outlet on the basis there was a queue there so it must be popular. Then I totally picked the wrong food as I had their prawn mee which was swimming in a pool of oil. Urgh! She must have ladled all the oil that floated on top in my bowl! I am so not having this dish ever again as it was horrible. I must have ordered the wrong thing as the crowds were just rushing towards this particular outlet signifying how popular it is, maybe I should have eaten their Pan Meen instead. Splashie Boy had better luck with his lunch which was Thai Beef Paprik with Rice. 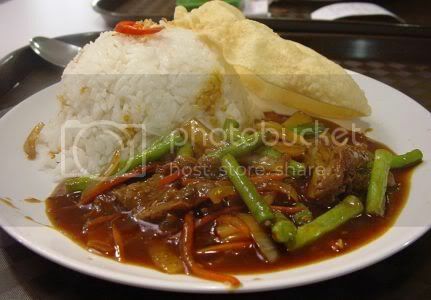 This is a pretty common dish that is served in Thai fast food places in Malaysia, a stir fry of beef strips and vegetables in oyster and dark sauce. I had a bit of his beef and it was pretty tasty. Portions are quite small here but prices seem to be cheaper than the KLCC foodcourts. 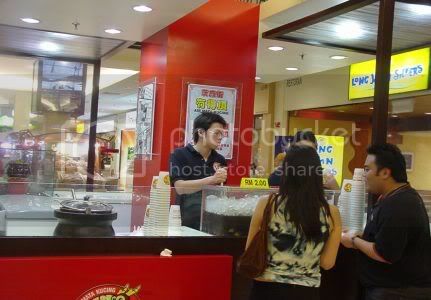 On top of it, there is a limited 15% discount on all food and drinks within the foodcourt. I liked their entrance, kinda reminded me a bit of the sleazy Uncle Ho of TV Smith. There is even an Auntie Ho that serves the drinks at the foodcourt. As I am new to the foodcourt, would love to hear any recommendations on what else to eat or avoid at the foodcourt. By the way, Little Penang Kafe has opened at the top level of KLCC (where Rain Nudle House used to be) and it's packed with people. I am not much of a pasar malam (Malay for night market) person but I am trying to change for the better by making a point of visiting them more often! That is why, for the first time after almost ten years, I braved the traffic jams and the almost about to rain weather to do a quick walkabout around the SS2 night market for my dinner. I totally did not regret getting stuck in a traffic jam and circling around to look for a car park space as I found treasures around the stalls that flank the square within SS2. First find was something I had not eaten for years and years, a kueh tu tu stall. I thought these were extinct ever since I lost my favourite stall near Petaling Street. Not sure why they went out of fashion in Malaysia but it is still going strong in Singapore. You can see people are totally unfamiliar with this kueh as when I was queueing up for my kueh, kids will walk past and stop to point plus talk among themselves that they have never seen this kueh before. Even a couple who claimed they were from Singapore were curious claiming they have never seen anything like this before. 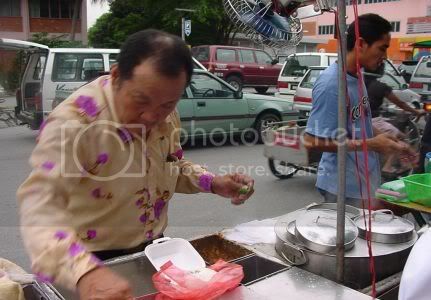 The uncle selling the kueh tu tu said he has been doing this for the past forty years. He claims he was previously selling the kueh in Petaling Street. My Cantonese is pretty hopeless so I caught bits and pieces of the conversation I had with him. He told me he has been selling this kueh somewhere else most of the time but he does this once a week during the pasar malam. He works really fast hence I couldn't really capture some parts of him making the kueh. He will fill a mould with rice flour, put the cooked brown grated coconut filling inside it and cover it with some more rice flour. 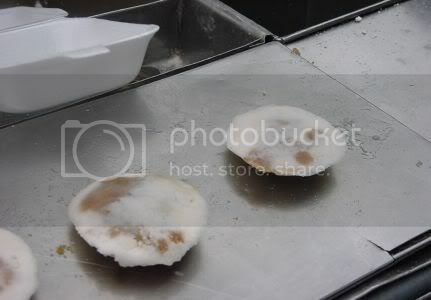 A white square cloth is placed underneath the kueh and placed in the steamer. 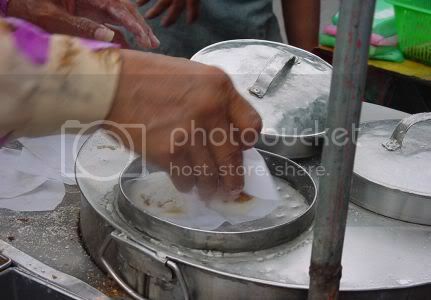 Once ready, he unmoulds them and places a piece of pandan leaf underneath it. It is then packed in plastic boxes or bags for the customers. I bought three kueh tu tu for RM1 which I took back for my dessert. Really yummy stuff even though they were not piping hot. For those who are unfamiliar with this kueh, it's kinda like the Malay putu piring or putu bambu except the flour is slightly different (it's packed more) and the filling is cooked coconut with gula melaka (Malay for palm sugar). Another variety they have is crushed peanuts as the filling. 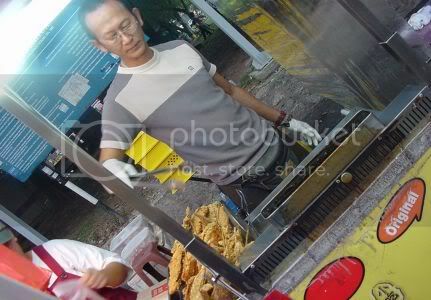 To find this stall, he is located in front of the SS2 police station. You may have to wait a bit for him to steam the kueh tu tu or there may be a queue waiting for the kueh. I chanced on this fried chicken stall and decided it must be very good as they had two outlets within the same night market (One stall is along the McDonalds stretch) while the other stall is nearer to the hardware stall. When I walked past the first outlet (along McDonalds), I heard a comment from a passer-by to one of the guys queueing for the fried chicken praising him for knowing what to eat in the market. That peaked my interest and I thought I'll get some when I walk back. So when I saw the second stall, I thought I better just get it here since the queue was not too long. My pictures are at a funny angle as I took them while queueing up for my food (by the way, a lot of patience is needed for foraging food in the night market since queues can be long). 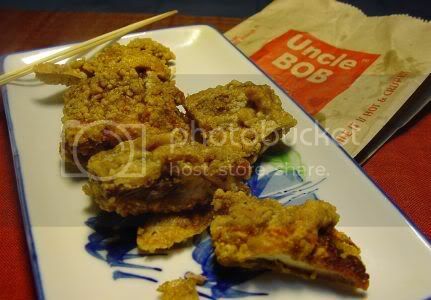 A quick look at their signature dish and it looked a bit like the Shihlin Taiwanese XXL Crispy Chicken. Besides the chicken chop (Shihlin lookalike) they also sold deep fried chicken wings on a bamboo skewer. They will chop the chicken in small pieces and then sprinkle chilli and a spice powder on top of it. Then it is plonked into a brown bag with skewers for you to eat when you walk around the market. On the way home, I stole a few pieces and it was super yummy. Had to really brace myself not to finish it all since I wanted to take some pictures when I got home. Price wise, it's cheaper than Shihlin since it's selling at RM4.50 without any service tax (Shihlin's chicken is RM4.80 plus 5% service tax). It's even halal as per their brown bag information. What else did I get in the market? I chanced on something I also have not eaten for ages, kerabu chicken feet. It's basically chicken feet skin that is nice and crunchy (not too sure how they do it), chopped onions, chopped chilli padi and mint leaves tossed in a nice tangy dressing. Simply yummy and fiery stuff. You can get this for RM3 all packed up at a stall near the Island Cafe. 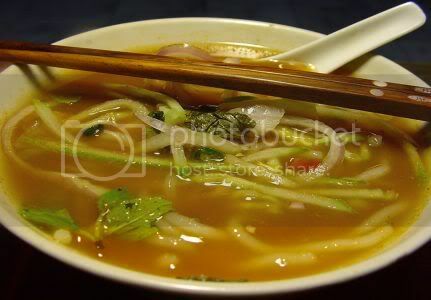 I also had assam laksa which I tar paued (Chinese for packed back). The soup is nice but I would have liked a teeny weeny bit more of fish in it. Guess you can't expect much since it was only RM3 for a bowl. This is from the van near the hardware stall. I think I am hooked on this pasar malam as I plan to make another trip there again (weather permitting) to try other stalls so you may get further posts on food from this place. For those of you who are totally familiar with the pasar malam there, I would love to hear your recommendations on which stalls to try out since I am a total newbie with this place. Spittoon Extra is running a one-off meme asking bloggers to feature what they ate for their breakfast on Sunday, this November 20th. At first, when I read about the meme, I brushed it aside as I so rarely eat breakfast nowadays. During the week days, breakfast is almost non-existent for me and nowadays even weekend breakfasts have become a limited edition. Surprisingly, we got to eat breakfast yesterday as we had a nice early start since it was cleaning new house day. Splashie Boy and I chose to eat at our regular mamak stall just round the corner from my place. These guys really know both of us so well: our drinks will arrive on the plastic table within seconds after we sit down. 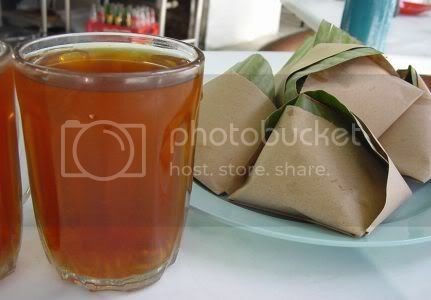 Essential for morning brekkies is a nice hot glass of tea with a dash of calamansi lime juice (Teh O Limau Panas in Malay). By the way, I thought I'll also show you the Nasi Lemak packets on the side. The stalls will pre-pack them in brown paper and banana leaves so you just pick one from the table. 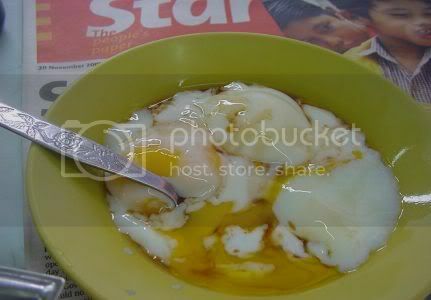 I always have two half boiled eggs with a dash of soya sauce at the mamak stall. This kinda reminds me of my childhood days as my mother used to force us to eat the eggs for breakfast every morning before going to school. Surprisingly, I converted Splashie Boy to have this too and he now adds this to his weekend brekkie menu. Another essential part of our lazy Sunday breakfasts is the Sunday Star (you can see it below the eggs) which comes in handy sections so we can share and read. The paper is a favourite for both of us since we have two friends writing articles in the Sunday Star Mag. After a quick peek at the headlines, (what!? that six year old kid can teach mathematics tuition), we had a nice crunchy Roti Planta. 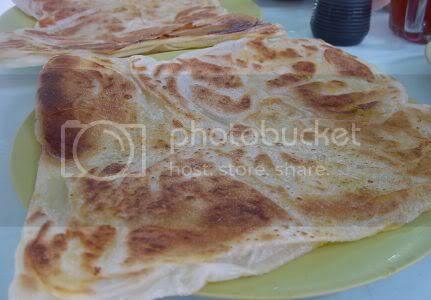 This is essentially a roti canai stretched out and slathered with Planta margarine. It gets nicely toasted on the griddle till it's crispy. I eat mine plain while Splashie Boy always has his with dhall (curried lentils). Drats! It's time to leave our leisurely brekkie and start work! Sigh! So much to do during the weekends and so little time. Hope you enjoyed your weekend and breakfast too. Would love to hear what you all had for your breakfast yesterday, so do drop me a comment. Adopt me please!!!!!!!!!!! Take me home as I am a loving little kitty. I'm in a huff with Mum and we're not talking to each other this weekend. Why you ask? 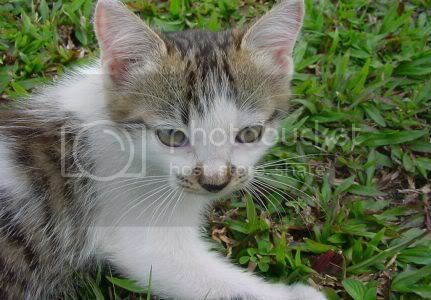 Well, she told me there are three kittens at the other house that need a loving home as their owner do not want them. We must go look for homes for them or else she threatens they will come and stay with us in the new house. No way!!! I am not letting anything cuter than me join the household. It's already bad enough I have to share my little world with my brother and sister. So, I appeal to all you nice aunties and uncles, take them home as they are adorable (according to Mum) and know how to play football just like David Beckham. Not many pictures of the three of them as it's extremely difficult to take pictures of moving kittens but we have their group picture and the black kitten's picture. On a happy note, my good friend Kiri the man (big smooch!) is back in action with Auntie Clare hosting this weekend's WCB. 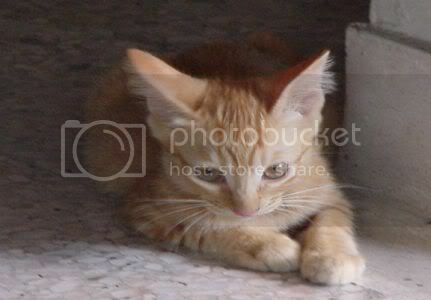 So head over there for lots of kitty action and waggy tail action over at Auntie Sweetnicks. P/s if you wish to take the kitty above or the ginger or the black kitty in the pictures, do email Mum at boo_liciouskl@yahoo.com for further details. I will definitely make sure she will reply you. It's Blog Party time and this month is the holiday edition as proposed by our lovely host, Stephanie from Dispensing Happiness. Hasn't time flown? I can't believe it's almost the end of the year and I should be planning Christmas gifts, Christmas parties and New Year celebrations. As turkey is way too big for both of us, for my Blog Party, I made an Asian feast and served up Chiku Lassi and Satay Lilit. Chiku is a fruit also known as Sapodilia which is popular in Asia. We get Chiku trees blooming with fruit all year round and the fruits are found in most stalls. I remember when I was young, we had a Chiku tree in our garden which bore us lots of fruits and kept me happy as it was my favourite fruit. Sadly my mother cut down the fruit trees in the garden as she said it was too much trouble looking after them so now it's just a plain green lawn. 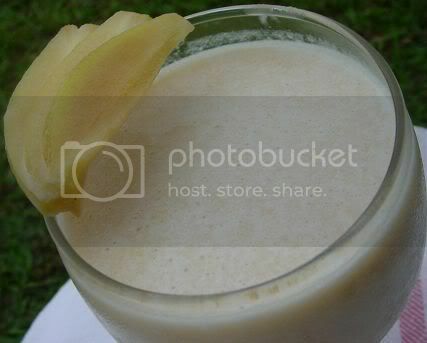 For my Chiku Lassi which I got inspiration from drinking a Chiku Smoothie recently, I blended a yoghurt lassi with cut Chiku fruits. Truly yummy stuff especially served ice cold. For eats, I served a dish that is unique in this region known as Satay Lilit. Usually the satay we eat in Malaysia is made from meats and uses wooden skewers. This version from Bali uses minced fish and prawn mixed with aromatic herbs that is wound around sticks made from lemongrass. Inspiration for this dish came from a recent Malaysian Women Weekly magazine (i.e. the localised version of Australian Women Weekly) where they featured dishes for Deepavali and Raya celebrations. 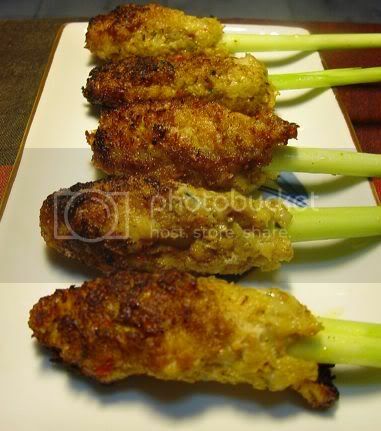 I loved the satay with it's lemongrass aroma and the texture which is softer than the usual meat satays. Mince prawns and fish finely using a cleaver. Cover and refrigerate. Pound or blend chillies, garlic, shallots, ginger, turmeric, lemon grass and shrimp paste. Add coconut and continue blending till mixture is fine. Heat oil in a wok over medium fire and fry the blended ingredients for five minutes or until fragrant. Season with the salt, sugar and calamansi juice. Cook another one minute and transfer mixture to a plate to cool completely. Combine mixture with minced seafood. Take about 2 tablespoons of mixture and wrap around the base of the lemongrass stalk. Make about 20 stalks this way. Just before serving, brush with oil and grill on fire or pan fry till golden brown. Thanks to Stephanie for hosting and do check Dispensing Happiness this weekend for the Blog Party round-up.